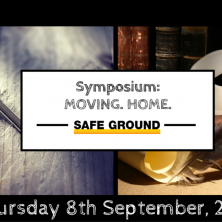 Each year, Safe Ground holds a policy event, bringing together people with criminal convictions, their families, Prison Service staff, academics, practitioners, artists, community members, policy makers and other interested parties to discuss relevant issues and themes we identify through our year’s work. This was the culmination of a year long series of public events to celebrate the occasion. At this important milestone in our unfolding history we took a moment to examine the terrain on which we seek to progress. The aim of MOVING. HOME. was to captivate, challenge and provoke ideas. Looking at why we do our work, how we work and who we work with in the current social, political and economic moment, questions of belonging, safety and security arise. What does home mean – for the people we work with? For criminal justice charities? For organisations delivering arts based education? Is a home possible in a world that is constantly changing and where people are constantly relocating? Does anyone have a right to a home? Shouldn’t charities be constantly reviewing and refreshing their purpose and value? Why should people leaving prison be guaranteed somewhere to live? Panellists included Baroness Helena Kennedy QC (writer, broadcaster and champion of civil liberties, human rights and social justice), Professor Sanja Bahun, Co-Convener of Transitional Justice Network at the University of Essex, Richard Ward, Head of Offender Learning at the Department for Business, Innovation and Skills, Dr. Andreas Aresti, Senior Lecturer in Criminology, University of Westminster, Lucy Davies, Director of 198 Contemporary Arts & Learning, Kelly Foster, Cultural Researcher and London Blue Badge Guide, Eloise Shepherd, Head of Housing & Planning Policy London Councils, Maureen Mansfield, Mental Health Manager – Women in Prison and Richard Lambe, Graduate of Family Man. This event really pushed the discussion between all parties and shone new light on how the criminal justice system could be developed.